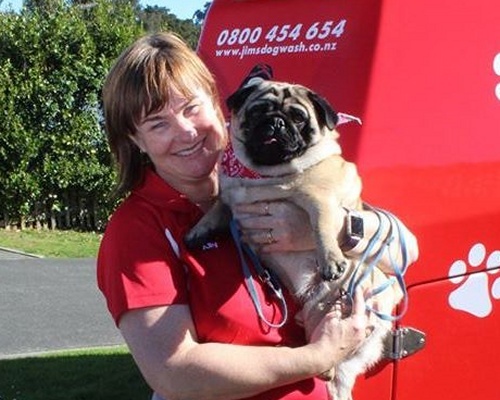 Hi, my name is Ally and I service Pukekohe and the surrounding areas. I groom all sizes of dogs whether you need a quick bath and nail clip or a full groom with clipping and styling. After spending the past 33 years working in various occupations for which I had no passion, I have finally found my dream job. I have had a lifelong love of animals of all shapes and sizes, so it goes without saying that I absolutely adore what I do! Throughout the years I have been involved in various ways with animals, including fostering for the SPCA and raising and boarding puppies for the Blind Foundation of NZ. I love meeting new dogs and their humans, and being able to play a part in making your furry friend look and feel their best. My reward is the joy on my client’s face when I hand their dog back and the affection the dogs give me both during and after the job is done. The dogs always come first to me and I treat them all as if they are my own. So, next time your dog needs a little TLC and you want the very best for them, look no further, call Ally on 0800 454 654.